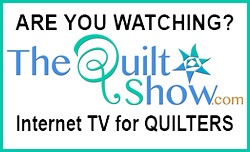 The image above was recently sent to me by Jan Magee, editor of The Quilt Life magazine. Jan lives in Denver and has easy access to neighboring historic Golden, Colorado which is home to the Rocky Mountain Quilt Museum. Do you notice anything interesting about the image? The quilt containing this embroidered signature is currently on display at the museum in an exhibit calledOver Here: Quilts that Got Us Through World War II from the collection of Sue Reich. The exhibit runs through April 30, 2011. It was made in June of 1944 from Clay and Montague counties in Texas, & Newport Texas. The quilt includes embroidered names of soldiers from these counties serving in the military. My family name is Tims (not Timms) though both are a derivative of Thames (prounouced Tims) which is also the famous river that runs through London. Tims with only on 'm' is much less common that Timms with two 'm's. My father, Richard Lee Tims, grandfather Lee Otis Tims (Boots), and my great grandfather, Lee Roy Tims, all lived in Clay County, TX so it seemed there would be a likely connection to the name Loyd Tims of Newport, TX. My great great grandfather Wesley Tims was raised on (or very near) the famous Civil War battlefield in Shiloh, Tennessee. He was about 13 years old during the Battle of Shiloh in April 1862. After the battle they the family relocated to Texas. Eventually Wesley married and lived in Mansfield, TX near Ft. Worth, TX. Wesley had at least two sons, one was my great grandfather, Lee Roy Tims, the other was Troy Hubert Tims. Troy is the father of Loyd V. Tims (named and stitched on the signature block) who is a first cousin to my own grandfather Lee Otis (Boots) Tims (son of Lee Roy Tims). Loyd (yes, that is the correct spelling) died in 1977 in Wichita Falls, TX. 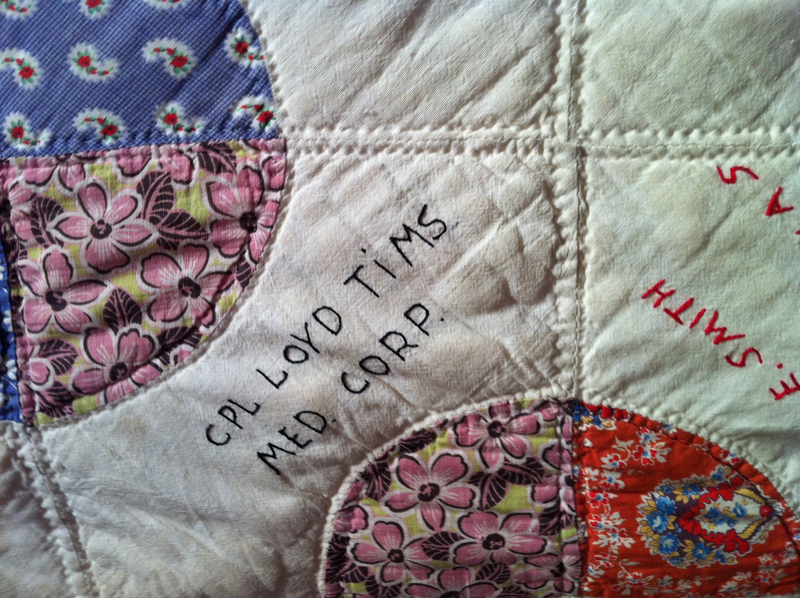 Naturally it is exciting to see a relative's name embroidered on a historic quilt hanging in the museum. Don't worry if you got confused, just know it was a cool quilting connection. Now, can you guess my middle name? I'm going to forward the site on to my mother-in-law. she lives northwest of Vashti and is a quilter. Just came across your web site. I live in Clay County and have a lot of family that live near Boots Tims Road. It HAS to be Lee! I'm sure your middle name is Lee. I followed the family history you posed with no problem. 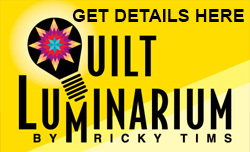 Quilts and family history just seam to go together naturally. By the way, our family "Name" is DEAN, Lester Dean, Upton Dean, Billy Dean, Othal Dean.... Don't you just love it? It's got to be Lee. What a great family history! I'm pulling for Lloyd. That's my middle name and it's also a name from my family. Ricky Lee has a ring, don't you think? What a wonderful link back for you in this quilt. Wish you'd come back to Pigeon Forge for QuiltFest some year soon. What a wonderful link back for you in this quilt! I guess your middle name is Lee? We loved to hear you playing in Houston! 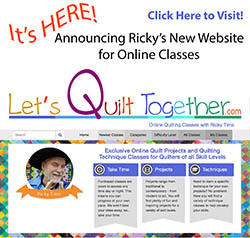 How exciting for you to make a connection with this quilt from the Newport, Texas area. It is truly an amazing piece of WWII ephemera. Hope you get to see it some day.